Saving time, ease of locating products, greater product variety and selection, and avoiding checkout lines are among the reasons people turn to ecommerce rather than shopping in-store. FoyerLive offers solutions to each of those issues, providing a better customer experience and addressing major causes of lost sales. FoyerLive isn’t just a solution for brick and mortar retailers. It also makes it easy to integrate ecommerce and brick and mortar operations. Their endless aisle digital kiosks bring many of the conveniences of ecommerce to brick and mortar shopping, empowering retailers to create a nearly seamless shopping experience as well as a more personalized one. Here are a few examples of FoyerLive applications that solve everyday problems for retail associates, managers and customers. 1. Ease of exploring product features and reviews. For technically complex products, the information on the box or print display isn’t enough to go by. If you’ve ever browsed product information on your phone from a store you’ve probably sensed that there’s a better way of doing things. Now there is. 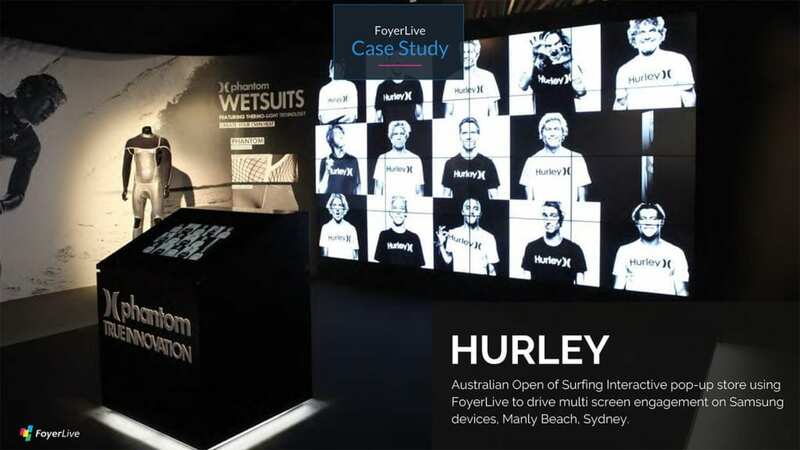 FoyerLive’s interactive kiosks allow customers to view product descriptions, comparisons, demos and reviews on attractive touchscreen displays. If they’re just getting started they can search by category and add items to a cart. One perceived advantage of ecommerce for shoppers is access to customer reviews. People can be hesitant to buy products without seeing how they’ve measured up to other consumers’ expectations. If your customers aren’t looking at these reviews in store, odds are they have in advance. Facilitating that can increase sales and reduce product returns. 2. Eliminate stress and guesswork. With FoyerLive’s capabilities, retail associates don’t have to memorize as much product information as they otherwise would. If they can’t answer a question off hand they can easily access product information using digital kiosks. The employee and customer are viewing the same information on the same screen and the employee can fill in where he or she has specialized knowledge. This is especially valuable if your store has complex products or a large number of SKUs. 3. Reduce lost sales from out of stock items. If you don’t have the right color or size in store, no problem! FoyerLive gives you ominchannel fulfilment options, allowing customers to order out-of-stock items for home delivery. Customers don’t have to make inconvenient return trips to get what they want. For retailers, that amounts to fewer sales lost to online competitors. 4. No more yelling over the changing room door. Even if delegated to a retail associate, going back and forth between a dressing room and clothing racks is time-consuming. Some people dread this aspect of clothes shopping. Digital displays in changing rooms allow the customer to order additional sizes and colors without leaving the changing room or verbally communicating detailed information to a frazzled associate. 5. Queue Management: Reduce or eliminate lines. With FoyerLive you can give customers a self-checkout option if that’s appropriate to your business. That means your associates are available to help customers with needs other than sales transactions. Ergo you can provide a more personalized experience as well as greater convenience. Alternatively or additionally, customers can order products from anywhere in the store so they’ll be waiting when it’s time to go up front and pay. 6. No more scrounging for products on crowded shelves. FoyerLive’s touchscreen navigators free customers from meandering through aisles in a long and potentially fruitless search. Guests can now request products or find them with digital item locators. Since they can order physical products from the back of the store with touch screens there’s less need to keep them all up front. The additional space creates a more pleasant all around experience. Nike, for instance, uses FoyerLive digital displays to allow customers to pick shoe and clothing styles, colors and sizes. Employees collect the requested products and bring them to customers to try on at pop-up stores and in store. 7. Choose the right vintage. Most dinner hosts don’t harbor sky-high expectations as far as their guests’ beer or wine contributions go, but it’s nice to make a good impression. What goes well with tri-tip steak? How about scallops, quesadillas, BBQ chicken, or samosas? I have no idea and there’s a good chance even a well-trained clerk at a liquor store doesn’t either. Digital kiosks provide educational tools for both staff and customers for just this kind of situation. This functionality makes up-selling easier as well as educational. People are happy to pay more when they’re confident that they’ve chosen the right product. 8. Effectively multiply your sales associates. Many of the above applications allow associates to get more done, better manage peak hours and provide more individualized service. Whether you’re a garden center, liquor store, boutique clothing retailer, a fireworks seller or the storefront for a major brand, these solutions free employees from busy work. They’ll be happier and so will your customers. 9. Make products tangible to customers. Digital displays, by allowing customers to view how products actually work, make them more engaged and confident selecting products that suit their needs. Fireworks stores, for instance, use digital displays which allow customers to see what artillery shells, roman candles and other goodies look like in action. This list of applications is by no means exhaustive. The sky’s the limit. 10. A final note: Cost, functionality and integration. The cost and functionality of digital displays have improved a lot over the last five years. Historically setting up a video wall was exorbitantly expensive. Now you can get a decent-sized, touchscreen, commercial device and targeted, customizable digital display for less than a thousand dollars. In-store digital displays used to be stand-alone products. They’re now integrated with websites, and because FoyerLive is in the cloud, managers can control kiosks and display screens from anywhere. Displays can also be automated by time of day and special promos offered in real time. FoyerLive is designed to integrate seamlessly with other enterprise-level retail solutions such as NCR Counterpiont, so if you like what you’re using there’s no need for a complete overhaul. Many of our clients use multiple systems which compliment one another. In sum, FoyerLive is a diverse, customizable tool that different businesses can use in the ways that most benefit them. It brings many of the advantages of ecommerce to brick and mortar retail, while also facilitating ecommerce for those who do both. It provides convenience and assurance to customers who want to make the right choice and don’t have all day to do it. Contact Retail Control Systems for more product information or a free FoyerLive demo. We’ll help you find the best solutions for your store. We arrived at the Team Store thanks to Geff’s expert knowledge of Boston streets and unloaded our van of supplies. The crowd at the store and on the street outside were busy but mostly with stragglers killing time before the game. We met up with Lindsey, the Store Manager, and were quickly split up and put to work. While others went to the satellite stores in the stadium I worked at checking and updating the additional registers that were stored for the offseason and brought back in for the start of this season. Once the checklist at the store was completed, Geff and I accompanied Lindsey into the stadium to support a possible issue at one of the many kiosks. We followed closely as Lindsey masterly navigated through the stadium while pointing out each store location in case we were called there later. As we made our way back to the main store, we took a quick break to go into the stands to take it all in. I will always remember the quietness of the anticipation in the empty stadium knowing there are thousands of people outside just waiting to get in. We arrived at the store to a much different scene as all customers were moved out from the store and street to get ready for the gates to open. Once opened it felt like nearly all the true fans were heading straight to the store. Lindsey and her team of seasoned experts were more than prepared, and so were we. The pregame sales went very smooth with Molly helping at the cash registers and Matt, Geff and I assisting and monitoring for support issues. The issues we addressed were mostly straightforward and quick to resolve; answering questions, ensuring device functionality and making sure all settings were correct. As the game started and the store emptied we were left feeling relieved that things were going smoothly. Lindsey took our cell phone numbers and released us to walk the stadium and watch the game during the quiet time but assured us we’d be on call for when it picked up again! We were able to enjoy several innings of the game, including the incredible home run by Andrew Benintendi, while periodically checking on the satellite stores and the main location to answer any NCR Counterpoint related questions they had. We made our way back to the main store to finish watching the game – which ended in a win for the Red Sox! After the announcement the excitement grew from the store staff as they knew what was coming next. While close games with wins are great for everyone, it does mean that all the fans leave at once and many want a last minute souvenir from the store. For most of the RCS lineup this was the first time to assist The Red Sox with a home opener; although it was a bit overwhelming for a split second as the store became full with excited fans, the Team Store staff was unnerved more than prepared to handle the demands with professionalism. We did what we could to help as needed while staying out of the way as the staff did what they do best, serve the Red Sox fans of the Boston area. We stood behind the registers as customers came and went, helping with stocking and bagging and again with any NCR Counterpoint questions that came up. As we packed up, said our goodbyes and left we all felt like we helped to ensure that our customer, and most importantly to them their customers had a smooth and successful day. While there were many take-aways and experiences the feeling we were left with was this: The only greater feeling than being on a team is being on a winning team! I would like to thank the RCS team as well as Lindsey and the Team Store staff for the opportunity to work together to guarantee one of many winning days. (ENFIELD, NH | FORT COLLINS, CO) – Retail Control Systems (RCS) is pleased to announce our customer spotlight for the month of April, Hickory & Tweed. Hickory & Tweed has been an RCS customer since 1987, the year RCS was founded. Hickory & Tweed began as a ski shop, founded in 1961 by Jim Ross, in Armonk, NY. The stores current owner, Skip Beitzel, purchased the store from Jim in 1985 after working there throughout high school and while he attended school at the University of Vermont. After which, a bicycle shop was added to the well-established ski business. The store’s name pays homage to the origins of the sport itself, with hickory being the wood of choice for first generation skis and tweed wool being the most common layering insulation at the time – hence the name, Hickory & Tweed. From its early beginnings, Hickory & Tweed has established itself, not only as one of the premier ski and bike shops in the country, but an iconic brand in the ski business. The store has won numerous industry awards over the years, including “Ski Shop of the Year” from Ski Magazine and “Top 150 Bike Shops” from the National Bicycle Dealers Association. Their hallmark offering is a family ski and snowboard leasing program, which serves nearly 2,500 families. Hickory & Tweed is a family business, just like RCS. Skip’s son, Mac Beitzel, manages their recently introduced ecommerce site. Mac created the store’s ecommerce site utilizing NCR’s retail online (NRO) application. Mac also manages the store’s social media and private label branding business. Hickory & Tweed is also staffed by many long-time sales and management associates who are passionate about winter sports and cycling. The staff can often be found on the slopes or out riding the local trails. Based on the knowledge of their passionate staff, Hickory & Tweed’s service and atmosphere has always provided a unique shopping experience for their customers. Almost 30 years ago, Hickory & Tweed was frustrated with several attempts to implement a point of sale system that not only worked for their business, but was easy for staff to understand and use. In early 1987, Dave Albert was preparing to start a new venture in the point of sale industry after working for many years in the bicycle industry. Skip had a chance encounter with Dave at a bicycle tradeshow. Skip and Dave kept in touch and once Retail Control Systems opened its doors, Hickory & Tweed was the very first customer! Hickory & Tweed also ended up hiring Dave to consult for them when they were first opening the bike shop portion of the store. Since then, RCS has become intimately involved in all of Hickory & Tweed’s operations. RCS has successfully upgraded the store’s entire Counterpoint Point of Sale system several times and it’s always been a relatively easy process for Hickory & Tweed. Skip and Mac regularly attend RCS’ Envision Conferences, in order to stay up to date with RCS’ latest offerings. RCS is so proud to have Hickory & Tweed as such a loyal part of the RCS family for so many years. We can’t wait to see where they go in the future and how RCS can help them reach their goals! (ENFIELD, NH | FORT COLLINS, CO) – Retail Control Systems (RCS) is pleased to announce our customer spotlight for the Month of March, Westchester Road Runner. Prior to working at Westchester Road Runner, Karen was a network administrator for 25 years in the non-profit sector. She had never worked in retail. Prior to working with RCS, she was given 2 days of training on Counterpoint, before entering orders in the system in a way that was not an efficient or effective use of time. When RCS partnered with Westchester Road Runner, they consulted with Karen and developed new workflows for entering purchase orders for future buying, saving valuable time and helping to put products on the shelves quickly. With this knowledge, she was able to enter orders months in advance of their arrival. RCS also worked with Karen on how to operate and maintain a Microsoft SQL Server (the database system Counterpoint runs on). This gives Westchester Road Runner a better insight into what’s happening in their system. Founded in 1987, Retail Control Systems specializes in retail and restaurant management software and hardware solutions. RCS has built a reputation for finding specialized business management solutions that help businesses gain complete control over their operations and finances. From inventory control to daily sales management, RCS has the experience and expertise across the full-range of retail and restaurant industries to meet the unique needs of any business. RCS has been providing superior customer service, exceptional quality, and innovation to the retail and restaurant community for nearly 30 years. To learn more about RCS, visit www.retailcontrolsystems.com or call 1-800-417-3030. For more information about Westchester Road Runner, their products, and services, visit Westchester Road Runner on Facebook. NCR’s purchasing and inventory control capabilities allow your store to seamlessly manage a huge range of inventory—from roller skates and hockey sticks to basketballs and golf clubs—so you have all the information you need to maximize your sales and stock. Serial number tracking provides an all-inclusive record of each product, so that you and your staff can easily check which items are in-stock, which items are on backorder, and when an item’s warranty will expire. This detailed product information enables store personnel to make informed recommendations to customers—meaning your customers will have a quicker and more-improved shopping experience. NCR Counterpoint also easily allows merchants to monitor customer buying preferences so that they can create tailored customer loyalty programs and e-mail promotions to strengthen customer relationships and boost sales. With NCR Counterpoint, integrating your store’s brick-and-mortar activities with your online sales is a breeze. Customers or in-store personnel can quickly and easily place an order online, while your store’s inventory is instantly adjusted to reflect the sale. In short, you will know exactly what your inventory looks like at any point in time—both in-store and online. NCR Counterpoint enables managers to monitor the productivity of store employees and departments by items- and dollars-sold, which means calculating sales commissions is no longer a tedious task for management. So, if you aren’t happy with your current point-of-sale system, or you’d just like to learn more about how NCR Counterpoint can offer your sporting goods store a better way to manage inventory, sales, AND customer relationships, give Retail Control Systems a shout! We’re here to help your business run smoother than ever! We’re happy to schedule a personalized demo so that you can learn more about how NCR Counterpoint can not only make life easier for you, your employees, and your customers, but can also improve your bottom line. Give us a call at 1-800-417-3030 or CONTACT US to get started! Will your retail operation benefit from the RCS/Cegid partnership?